Sign up for free and just shop with Manchester Airports Group - Official Car Parking as normal. Our average member earns over £300 cashback a year. Manchester Airports Group - Official Car Parking cashback can be earned simply by clicking through to the merchant and shopping as normal. 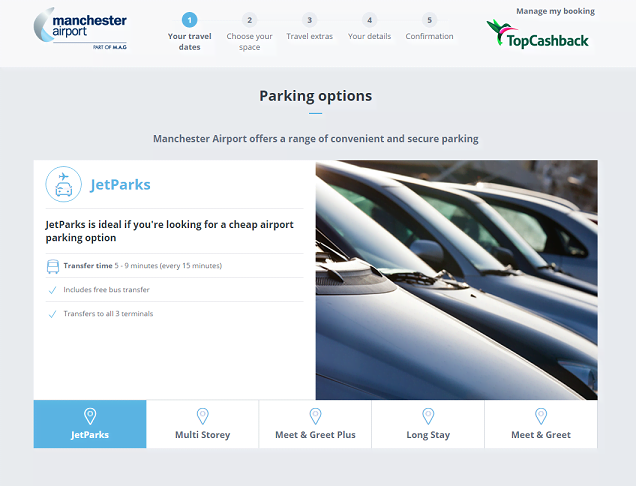 Manchester Airports Group - Official Car Parking Cashback is available through TopCashback on genuine, tracked transactions completed immediately and wholly online. For Lounges and Fastrack purchased the cashback amount is only available on the Fastrack or Lounges part of the purchase. The remaining part of the purchase (car park) will have its own cashback tier. Browse official Manchester Airport options through Manchester Airports Group, with whom you can book secure and convenient on-site parking. Whether you are looking for multi-storey car parks which are close to check-in, greater value parking further out but which is still only a short bus ride away or an easy and quick meet and greet service, you will be able to choose from a variety of different options to suit your needs and budget when flying in and out of the city. You can book your parking package in five easy steps. Just enter details of the days you will be arriving and departing, as well as the times, and select the departure terminal of your flight. Click the 'Find Parking' button and you will be presented with a range of services and their prices. Browse the parking packages to find the one which best suits you and get booking. If you are not already signed up to TopCashback, fill in the form below and start saving with our Manchester Airport Parking promo code and cashback deals. If you are looking for a cheap Manchester airport parking solution, JetParks could be the ideal solution. It includes a free bus transfer to any of the three terminals, which run every 15 minutes and offer a travel time of 5-9 minutes, making JetParks a great option whichever airline you are flying with. This gravel surface car park has Park Mark security status, is well lit and operates Automatic Number Plate Recognition (ANPR) for simple entry and exit. Save on JetParks parking with our Manchester Airport Parking voucher code deals. With their multi-storey car parks, you can park next to the terminal and walk to your check-in desk in two minutes, while if you opt for this service, you will also benefit from cancellation protection. Take advantage of the fact that you can cancel or amend your booking for free up until six hours before your scheduled arrival time, meaning you could even cancel on the day if you needed to. There will be no need to spend valuable time searching for a parking space. If you opt for the only official meet & greet parking at Manchester Airport, a chauffeur will park it for you once you have dropped your keys off - making it ideal if you are a family with children. The transfer time is just a two minute walk, while your car will remain in a secure location while you are away and will be waiting for you when you return from your trip. Book meet & greet parking for less by going through TopCashback and taking advantage of our Manchester Airport Parking deals. With meet & greet plus, not only can you have your car parked by a chauffeur having handed over your keys, but your travelling party of up to six people will also benefit from fast track passage through security. Like standard meet & greet, the transfer time is two minutes, while with meet & greet plus, should you need to collect your car from a different terminal to the one you depart from, this can be arranged if you tell the reception team when you drop off your vehicle. Another benefit of meet & greet plus is that when you arrive, you will drive through their state-of-the-art inspection area, which will automatically scan the condition of your vehicle and help ensure it is returned exactly as you left it. If you are jetting off for a week or two on holiday, or are flying out for an international business trip, the long stay car park offers great value while still being a convenient option, and you can book it for less with our Manchester Airport Parking discounts. It is further away from the terminal, and will take you between five and 15 minutes if you are going to walk to the terminal, but it does include free shuttle bus transfers, which run every 10 minutes and take four or five minutes. With long stay, you can keep hold of your keys, while it is well lit for arrivals during the hours of darkness and operates ANPR for simple entry and exit. It also holds Park Mark security status. Manchester Airport is located in the Ringway area of the city and is 8.6 miles south-west of the city centre. You will find many maps of the airport on the website which will make your journey there easier. They can be found on dedicated pages for Terminal 1, Terminal 2 and Terminal 3. There are various ways of getting to Manchester Airport. You can drive there and use one of their official car parks, while trains run every 10 minutes to and from Manchester Piccadilly. Daily coach services link the airport to the Greater Manchester area and other UK cities, while private hire vehicles and black cabs have pick-up points outside all terminals. The airport also has a dedicated Metrolink station, with trams running every 12 minutes. How Many Runways Does Manchester Airport Have? Manchester Airport features two full-length parallel runways, three passenger terminals and a world freight terminal. It is the UK’s third biggest airport and sees more than 22 million passengers pass through it each year. More than 60 airlines offer direct flights from Manchester to over 200 destinations worldwide. The cost of Manchester Airport parking will depend on which option you choose. You can take your pick from meet & greet, meet & greet plus, multistorey, long stay and JetParks solutions. To get a quote, just go online and enter your entry and exit dates and times, and select which terminal you are flying from. You will the be presented with a list of available options and their prices, which you can book online. You will find a great selection of shops at Manchester Airport, giving you the opportunity to buy everything from fashion and beauty products to technology, books and wines & spirits. Purchase from leading high street brands such as Boots, Pandora, Next and Monsoon, while as well as being able to take shopping on the plane for free, you can also leave it with them in a safe place and collect it when you return. Manchester Airport covers an area of 560 hectares (1,400 acres) and is the only airport in the UK other than Heathrow which operates two runways of more than 2,999 metres in length. It comprises three passenger terminals and a freight terminal. Save on official car parking at Manchester airports with Manchester Airports Group and save money with these great cashback deals. You can browse a range of parking options and book in advance to save money. Choose from low-cost parking with a short bus transfer to the terminal, multi-storey car parks only a short walk from the check-in or a meet & greet service for extra speed and ease.